This installation was a continuation of the miniature project From P to R. As I photographed each page of the encyclopedia, I tore it from the book to keep the remaining pages as flat as possible. 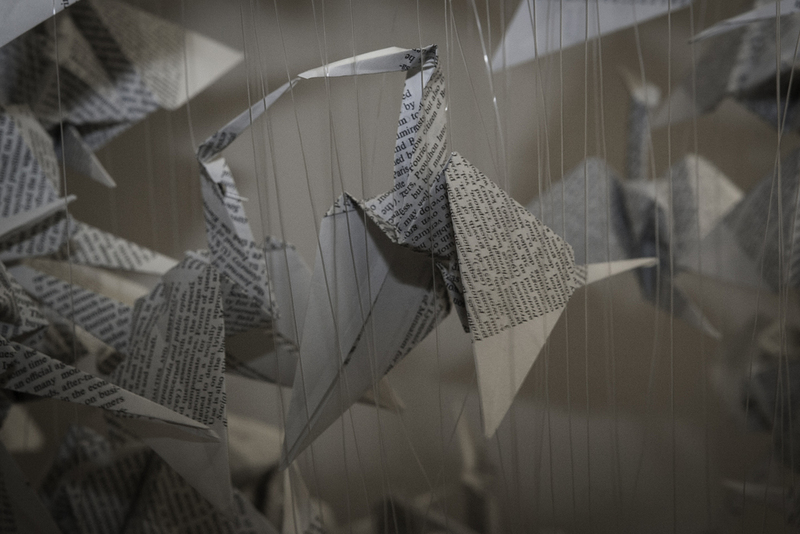 The discarded pages were folded into origami cranes, and suspended from the ceiling from a spinning motor. I created a site-specific installation for the Booth Gallery at Anderson Ranch Arts Center. The Booth was the former phone booth for the dorms where guests stay when visiting Anderson Ranch. The pay phone was removed, and the small space converted into a summer time gallery for staff and interns. As viewers opened the door to view the installation one at a time, the cranes started to twirl in a circle. Watch a video of the installation below. Over 300 cranes folded out of the pages of the Encyclopedia Brittanica, Volume 15, 15th Edition - from P to R. Site-specific installation.